If you are or know a food lover, this is the Christmas gift. Really. 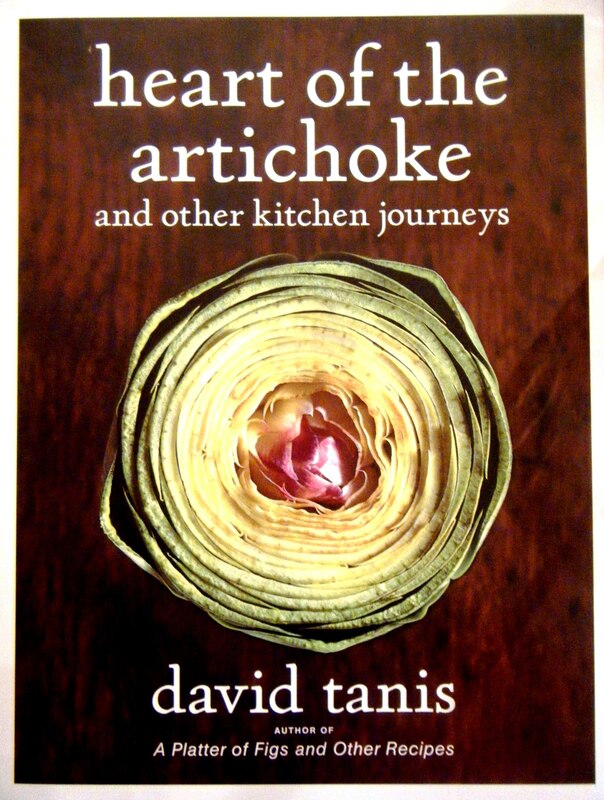 The Heart of the Artichoke, by David Tanis, is beautifully written and photographed. Much like those showpiece cookbooks that you will probably never cook from. But the true beauty of this book lies in its practicality. Co-Chef at Chez Panisse, Tanis’s cooking is the epitome of seasonality married to simplicity. His charming and unassuming personality shines through from the very start of the book. Yes, he cooks at the most loved and famous restaurant in the country. But here’s how he cooks at home. The book begins with personal food rituals that Tanis holds dear, from peeling an apple in one long curvaceous strip, to his methodic way of enjoying oatmeal (I have a similar quirk with French toast, ask me about it sometime), to the perfect simple meal of beans (lovely Italian white beans) on toast. It is a very intimate and throughly engaging book with each menu beginning with a story of its origins. You can sit and read this book. And when you do, you want to make these dishes. All of them. I can’t tell you how much pleasure I’ve gotten out of my copy already. It will be a well-loved treasure. Would you like a copy? Of course you would. You’re dying for one. To win one, in the comments section of this post, or in a tweet, tell me what is your favorite cookbook? You have until Tuesday, November 30, at noon to submit your entry. The winner will be chosen randomly using Random.org. For full giveaway rules, click here. Good luck, my dear readers. I hope you win! My favorite cookbook was the cookbook that had flip pages and you could create three dish meals by flipping the pages to match up. My all time go to book is Joy of cooking that my father got me many, many years ago. Joy of Cooking has taught me many, many things. But, I think Ina Garten has the best cookbooks hands-down. Her style is sophisticated yet simple. I have yet to make something that was not amazing. You can tell that she puts in the effort before releasing a recipe or cookbook. My favorite (this week) is my Mom’s food spattered Cooking with an Accent by Isabella Gaylord. Watch for the “chicken nerber” recipe on my blog in the next few weeks… Mmmmmm! It is a toss-up between Sunday Suppers with Lucques, which has some of my most favorite seasonal recipes in the world and just makes lovely dishes for any occasion and Mark Bittman’s How to Cook Everything which is a culinary must in my kitchen! My favorite cookbook is A Provençal Kitchen by Suzanne McLucas. It’s really given me a new way to think about cooking. Humorously, my favorite is the Dinner and a Movie cookbook. I loved the TBS series, I love movies, and I love food- it is the perfect combination of all three. This is the book that challenged me to go out, find and use different ingredients I had never heard of. My favorite cookbook was created by my parents and is filled with recipes for the meals that I grew up eating. Priceless. I have to say I have two. Mollie Katzen – The Moosewood Cookbook. Like tonight’s dinner, for example. I agree with Stephanie. Joy is fantastic as are the Ina Garten cookbooks. I love love love the Junior League of Portland, Maine’s RSVP. I grew up on the recipes in that cook book and some of my mom’s recipes are in there too. My two most used cookbooks are – a binder of printed recipes that I’ve been using & adding to for years; it’s full of my notes & comments as I’ve veered from the printed version. The other cookbook is pretty awesome- an old church cookbook gifted to me that contains recipes my Mom gave them when they were making it, as well as hand-written recipes she added to the index pages that were too precious to share with the masses. My own collection of recipes that are tried and true…family favorites!! I love all the Barefoot Contessa Books by Ina Garten. I have them all and wouldn’t ever trade them. Any of the Moosewood Restaurant cookbooks – I love them all! My favorite cookbook is Baking at Home with The Culinary Institute of America! Congratulations to Leeann! I have to say to all of you, I was so happy to hear what cookbooks you use and love. I especially loved hearing about homemade cookbooks and recipe collections you all have as part of your cooking arsenal. You are wonderful! If you didn’t win, I’ve got one last giveaway that starts right now. Good luck! I have a new one I just got out at the Library, Deb. Radically Simple. It’s amazing! Check it out!! I’m hoping Santa brings me one for Christmas. Thanks for the recommendation! I’m always looking for good cookbooks for our collection, and based on your description, this one sounds like a must-have!